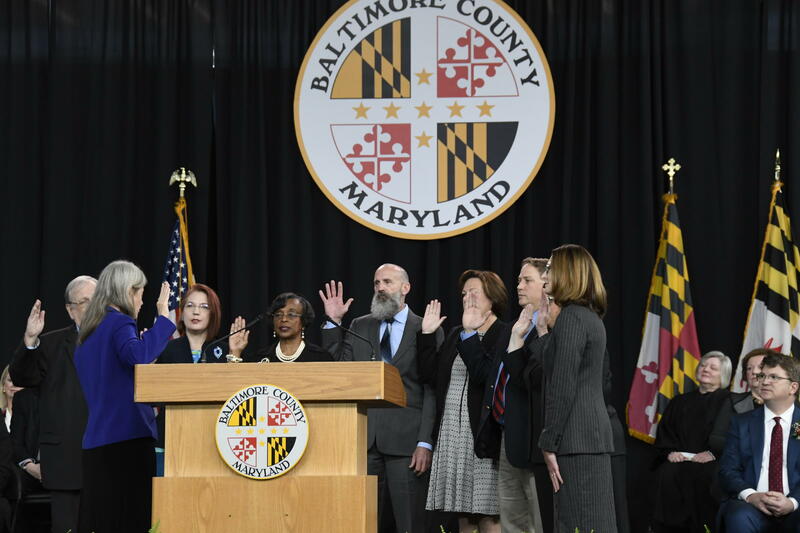 Members of the Baltimore County Board of Education are sworn in on December 3, 2018. The audit has been perhaps the most public flash point. This is the one you’ve heard about for months, an examination of the school system’s procurement practices. The audit finally will be released Tuesday night at the board’s meeting, according to board chairwoman Kathleen Causey. But the board has had a draft of the audit since January and did not cough it up despite calls from the county executive, county council, the teachers union and others to release it. A Freedom of Information Act request from WYPR was also denied. At the board’s March 5 meeting, Causey held the audit up for all to see. Causey said the school board’s attorney advised them the audit should not be released until it is finalized. But school board member Moalie Jose, speaking for herself and not for the board, said this has lacked transparency, especially considering the taxpayers paid for the audit. “This whole thing would have been avoided had we just expedited the process and not prolonged it and not sat on it for months,” Jose said. But Causey said her goal has always been to have the audit done as thoroughly and as quickly as possible. “We have critical needs for our students in so many ways we really need to make sure we’re using every precious funding dollar as effectively as possible,” Causey said. The wait for the audit has come at the same time the school board is searching for a permanent school superintendent. The interim superintendent, Verletta White, wants the job permanently. Last year, the old, appointed school board voted her in. But Causey and other opponents of White successfully asked State School Superintendent Karen Salmon to block the appointment. Salmon did so, in part, because the audit wasn’t complete. Both the original call for an audit and the need for a permanent superintendent go back to Dallas Dance. Dance resigned as school superintendent in 2017 and was later convicted of perjury for failing to disclose around $147,000 he earned for outside consulting work he did while superintendent. Jose, who is a new member of the board, said there is still anger left over from the Dance era. “There is this perception that the board is still dancing with the ghost of Dallas,” Jose said. The school board’s search for Dance’s permanent replacement is under way. A search firm has been hired. The superintendent needs to be in place by July 1. And by the way, if you’re interested, you have until April 29 to apply. Abby Beytin, the president of TABCO, the Teachers Association of Baltimore County, told the board that search has been a rush job. She pointed out the board took office in December, but didn’t get around to holding public hearings on the superintendent search until March, and those hearings came with less than one week’s notice. “Why was so much time wasted before this input was sought?” Beytin asked the board. But according to a school board news release, more than 4,400 people did fill out an on line survey about what they would like to see in a school superintendent. While time may be short, Verjeana Jacobs with the National School Boards Association said the county school board does have time to land a qualified superintendent. Jacobs said the transition from an appointed to a partially-elected board can be rocky. Board members have to figure out how to balance the complaints they’re hearing from voters with their relationship with the superintendent and staff who have the expertise. Under the new system, 7 of the 12 board members are elected. And 8 of the board’s members are brand new, and got dropped right in the middle of the superintendent search, the audit, and putting together next year’s budget. “It’s like drinking out of a fire hose,” according to Lily Rowe, one of the newly elected board members. Like other board members, Rowe insists she’s speaking only for herself, not the board. Those high-stakes decisions include the proposed budget the board passed for the next school year. It currently is on County Executive Johnny Olszewski’s desk. He has indicated he will have to make cuts to it, as he deals with a budget shortfall. While debating the budget, school board member Jose said at times some board members were cross-examining then rejecting information given them by members of White’s staff. During a budget meeting in February, interim superintendent White chastised the board for cutting off members of her staff who were trying to answer questions. Abby Beytin with the teachers union said the new board has been overloading the school system staff with questions. Beytin said board members don’t understand some of the issues, and at the same time don’t trust the staff that has the answers. “So that becomes problematic when you don’t trust when they’re saying ‘this is really important and here’s why,’” Beytin said. Beytin and others said this mistrust, again, goes back to the damage done by Dance when he was superintendent. But board member Rowe said they do have problems getting budget numbers they need out of White and her staff. Rowe said the staff has told the board what they want, so there is no incentive to help the board look for ways to cut. Board vice-chair Julie Henn said this is what you get with a partially-elected board. A majority of them are elected, and they’re hearing from constituents. So Henn said that means they’re asking the staff more questions than past boards. The board members will be tested in the weeks ahead, as their job includes dealing with the release of the audit, the fallout from promised budget cuts, and the naming of a permanent superintendent. Baltimore County Executive Johnny Olszewski said the budget passed by the county school board Tuesday night is not fiscally sustainable. The long-anticipated audit into the Baltimore County School System’s procurement practices will be presented to the school board and made public next week. That is according to school board’s chairwoman.